when they dive in dazzling pools. But my pop is a pirate . . .
he yells “aaarrrgghhh!’ and buries jewels. Every Pop – or Grandad – is different. But if your Pop is a pirate, he’s really really different from all the other pops. The pop of the young narrator sails on sharky seas,buries treasure and, at the end of the day, hangs a hammock in the sails. 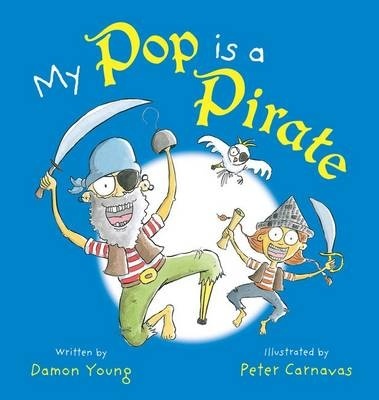 My Pop is a Pirate is a rollicking rhyming picture book celebrating grandfathers, their relationship with their grandchildren, difference – and, of course, pirates. From the creative pairing which also produced My Nanna is a Ninja, this new title has the same sense of fun, bouncy rhythm and humour, yet is not repetitive. The illustrations, too, are full of life and humour, and the love between Pop and his grand daughter is evident. Tom Applecross paused at the bottom of the gangplank to the French vessel, Marie-Galante, moored at the dock at Port Pandora. The air in this part of the port city smelled of sweat and squashed bananas, of salt and freshly scrubbed wooden decks and a strange, bitter odour that Tom suspected was his own overwhelming sadness. He turned to face his stepmother, Evlynne. He knew he had to ask her again, to plead with her one more time. He willed his bottom lip not ot quiver and took a long, slow breath. Tom’s father is missing, believed dead and his stepmother sends him away from his loved home in the Caribbean. She tells him he is very lucky to be going to stay with family in Boston, but he is not convinced that’s the whole story. She seems much too gleeful. Not long after they set sail, they are set upon by pirates and the Marie-Galante is scuttled. Can Tom’s life get any worse? He is set adrift in the Atlantic Ocean. He reaches shore and assesses his options. He can try to return to his home, live forever on an uninhabited island, or join the pirates. None of these options are looking very promising, particularly the last. The pirates have more superstitions than seems possible and somehow, Tom seems to be responsible for all their bad luck. At least in the short term, Tom must convince them he can be useful on a pirate ship. If he can’t, he may have to walk the plank. Chapter headings include definitions of pirate words or clues about the Pirate Code. On the Trail of the Golden Toucan is an adventure set (mostly) on the ‘high seas’. The pirates are a ragged collection of rascals with a fierce instinct for survival. They have a pirate’s code to guide their behaviour but the code seems to be flexible in its interpretation. Poor Tom struggles to make sense of it, perhaps because most of it is based on superstition. But Tom has had the advantage of an education and is able to apply logic and clear thinking to ensuring his own survival. There are ratbags and rotters everywhere, and not just on the pirate ship. There are themes of integrity, honesty, community. But first and foremost, this is a rollicking yarn about a boy thrust into an alien world who must adapt to survive. Recommended for mid- to upper-primary readers. Louie didn’t want to be a pirate. He wanted to be a chef. When Louie’s parents sign him up for Captain Blackheart’s crew, Louie has trouble listening to the Captain and joining in the crew’s escapades – because he is too busy dreaming of cooking delicious dishes. The other pirates laugh at Louie’s dreams, but when their ship leaves them stranded on an island, with nothing to eat, it is Louie who comes to the rescue. Louie the Pirate Chef is a light hearted story about following your dreams. With lots of pirate silliness, brought to life in the watercolour and ink illustrations of Ben Wood, this is a title which will make kids giggle. This title can be purchased from good bookstores, or online from Fishpond. Buying through this link supports Aussiereviews. ’tis a pirate’s life for me. Whilst there are plenty of ABC books on the market, the simple reason or this is that they are popular with parents and educators as an early-learning tool. An ABC of Pirates is likely to be also popular with young readers, offering, in addition to an exposure to the letters of the alphabet, an exciting pirate adventure. Each letter shows pirate characters in a range of exiting adventure situations. With the entry for each letter written in rhyming verse, the letter is used to begin several words in the entry, which are highlighted in bold font. The illustrations, by Heath McKenzie show the things mentioned int he text, as well as other items which start with that letter. For example, the ‘A’ entry has an astronaut, an alligator and an abacus in the illustration. Easy to read aloud and fun to explore visually, this is a swashbuckling, fun-filled offering. ‘It looks like lots of fun,’ Dad was trying to get Daniel and Emily excited about their adventure holiday. ‘It sounds lame,’ Emily yawned and looked out of the car window. ‘Don’t use that word, dear, it’s not nice,’ said their mother. 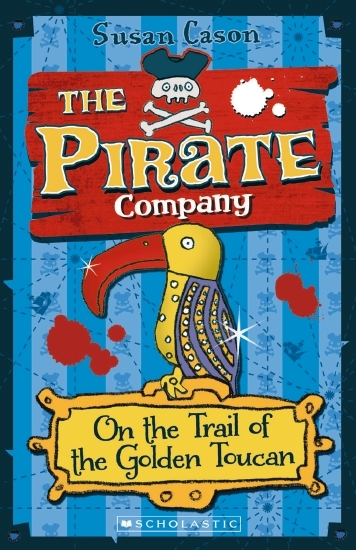 Emily and Daniel are to spend a week at a holiday camp on a ship – the ‘Jolly Roger Pirate Adventure’. They are less thrilled than their parents who will spend the week at a luxury hotel. They arrive at the collection point on a beach and wait. They are collected by a pirate and his crew, but that’s about the only predictable part of their journey. The pirate has bad breath and a dripping wet beard, the parrot is called ‘Duckie’ and has no feathers. Even the crew don’t seem quite right. But Emily (confident and sophisticated) and Daniel (younger and a worrier) do have an adventure, even if it’s not quite the one the brochure led them to expect. Captain Wetbeard, pirate, has a dicky back and likes to call his crew ‘scurvy brats’. Apart from being a recognisable pirate saying, it means he doesn’t really have to remember any names. He arrives at the beach when Emily and Daniel are due to be collected by Captain Funbeard for their week on ‘Jolly Roger’ and takes them to his ship instead. What follows rocks and rolls much like the ship at sea as Emily and Daniel find themselves in and out of trouble. The main characters in Captain Wetbeard are eleven and nine years old, but this story is likely to appeal to younger readers with its on- and off-board escapades. There’s also a hint in here that fun can sometimes be found in unexpected places. Recommended for mid-primary readers. This book can be purchased from Fishpond. Buying through this link supports Aussireviews. Jess’s father is lost somewhere out at sea. She can bear the waiting no longer and so sets out to find him. After a terrible night and day tossed by a storm, Jess finds herself in a graveyard of ships – all wrecked by the giant Pigtails the Pirate. She also finds her father, locked in a cage where he is forced to play music for the pirate. Using her sharp thinking, Jess frees her father and they almost escape. When Pigtails sees them however, he flies into a rage and seizes Jess’s father. Jess must think fast if she is going to rescue her father and get them both home safely. There is a retrospective feel to the story and the illustrations of this picture book: it has a feel of a classic fairy tale, with the giant pirate a blundering bully, and the scenes of the tiny Jess and her father trying to escape the eerie shipyard. Pigtails the Pirate is likely to appeal to a slightly older picture book audience, owing to the length of its text.